Continuing the slightly darker feeling, more agressive concepts and items… here’s the “Sundae Best Handbag” from James Piatt. I always wanted a set of brass knuckles, for no real reason… i also always assumed they’d hurt my finger hitting someone with them more than it would hurt the person! (but then again i’m just a little girl, not a ripped large guy) But this was cute, actually has a nice metal+black type of look, that could work with the cute black dress and heels on a first date. A little edgy, but still simple and subtle in a way? Ok, well they amused me. They’re available at Delicious Boutique in Philadelphia. You can phone order or order through website. I also want this purse, I am planning on getting shoes like this too! Where can I get one?! 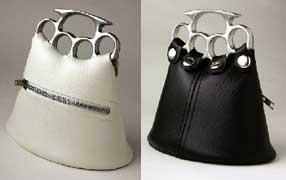 Am interested in carring these knuckle purses in my two retail stores. Please email with wholesale prices. Busted Knuckle Underground Clothing Co.
i need 2 have one. where can i get one and how much? I love this bag. Its so different. I have to have it!!! Please email me the info of where I can get it. Thanks! yeahhh i for sure need one of these. i saw them before, but i didn’t buy one. and now that i don’t know where to find them i want it. boo, any info on where i can get one? ive been looking for hours to buy some for my salon , where can i order from? explain to me where the hell I can find one of these. I want one and dont care how much it costs! where can I get a hold of one of these like to buy please contact me with the info…i love it it’s great!! !